We publish regularly on media innovations from Hamburg and at regular intervals on the major trends in the industry. You can find our insights in our blog or if you follow us under #dasmitmedien on Twitter, Instagram, Facebook or XING. Whether in traditional professions in the media industry, as journalists in large publishing houses, as creative professionals in advertising agencies and as content experts in the digital economy or even in companies that are supposedly outside the industry, media workers are the answer to the challenges of today’s media landscape and the drivers of its future development. They rethink proven technologies, business models, ways of working and thinking, skills and above all content over decades. Together with Deloitte and XING, nextMedia.Hamburg interviewed media workers in Germany in 2018 for the second time about current and future topics in the media and digital industry. The variety of media products based on artificial intelligence is constantly increasing. From podcasts created automatically to books written with AI to autonomous cameras: Media companies are increasingly aware of the potential of artificial intelligence and involve it in creative processes. The nextMedia.BestCases on “Artificial Storytelling” are a compilation of highly exciting, current AI projects in the content industry. Cooperation with the InnoLab of the Hamburg Media School. Von automatisch erstellten Podcasts über mit Hilfe von KI verfasste Bücher bis zu autonomen Kameras: Medien- und Digitalunternehmen sind sich mehr und mehr der Potenziale Künstlicher Intelligenz bewusst und involvieren diese in Kreativprozesse. 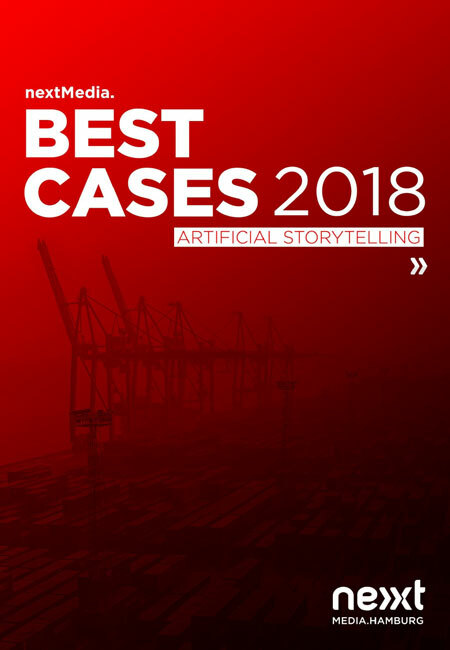 Die nextMedia.BestCases zum Thema “Artificial Storytelling” sind eine Zusammenstellung hochspannender, aktueller KI-Projekte in der Medien- und Digitalbranche. Eine Kooperation mit dem InnoLab der Hamburg Media School.